Home > Where Can I Buy Turf in Southampton? Are you planning on renovating your garden? 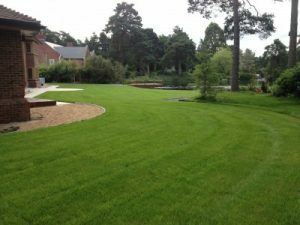 Are you wondering ‘where can I buy turf in Southampton?’ For lush and vibrant garden lawns, look no further than Abbey Turf. We are the turf specialists in Southampton, offering expert advice on all areas from turf choice through to aftercare. Why buy turf for your Southampton garden? If your garden in Southampton is looking dull and tired, new turf could be all you need to bring it back to life. High-quality turf provides a soft and attractive garden surface; perfect for entertaining guests or spending quality time with your family. It also offers many benefits to the environment and the ground. When you have a large area you need to cover, turf is an extremely cost-effective surface choice. Not only does it save you money, but it also adds value to your property, especially when it is well-maintained. When you buy your turf from our company, you can guarantee competitive prices, including discounts for landscapers and tradesmen in similar industries. Compared to other surfacing options, turf is relatively easy to maintain, as it does not require regular cleaning, unlike its artificial alternative. It is easily looked after by simple lawn mowing and regular watering. If you require any advice on the installation and aftercare of your Southampton turf, do not hesitate to ask our team who will be happy to help. Our turf is grown on our own sandy soils and is completely free of weeds to ensure the best product for Southampton customers. Before it is harvested, it is inspected on a daily basis to guarantee a consistently high quality. Once an order has been made, we make sure the turf is delivered to customers promptly in the freshest condition. We have been trading turf for many years, so you can rest assured that you are dealing with the best turf professionals in Southampton. We produce all of our turf ourselves rather than sourcing it from external suppliers, so we know that it meets the high standards that Abbey Turf customers expect. Whether you need turf to cover a small garden or acres of land, you can guarantee 100% customer satisfaction with Abbey Turf. For more advice on where to buy turf in Southampton, contact Abbey Turf on 02380 812302 or send an email to info@abbeyturf.co.uk.